This latest version of the MK Directory of Useful Information has been updated and enhanced to be our most comprehensive guide ever. We hope that it will be helpful to all disabled people, especially those who are new to Milton Keynes or recently disabled. The guide has brought together information held on our local database and additional research. We have made every effort to ensure that the information is up to date and accurate at the time of going to print. Inevitably situations change, so please get in touch with us if you find any inaccuracies or if you know of other groups that could be included on our database and in later editions of the Guide. We are always looking to improve the service that we offer and would welcome any feedback you can give on the Guide. 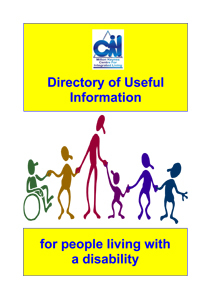 Download the latest copy of the MK CIL Directory of Useful Information here.